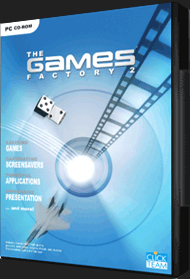 The Games Factory 2 is a program to create 2D games using drag and drop. This program is intended to provide a way for adults and children to get started in the games creation. The Games Factory provides all the stuff you´ll need to manufacture Arcade games, Platform games, Adventures and Screen Savers. To do this, you´ll have to click on an object, drag it to the play field, and choose the action it should perform. All the heroes, monsters, powerups, sounds and music are ready-made, but you can add your own.. The program includes, in the Help section, a step by step tutorial that will guide you to create, in less than an hour, a complete game, called ChocoBreak, a clone of Breakout. Following this tutorial you will understand the basics of the creation of games, and later you will be able to build your own projects.